La France divisee par Gouvernements Militaires. 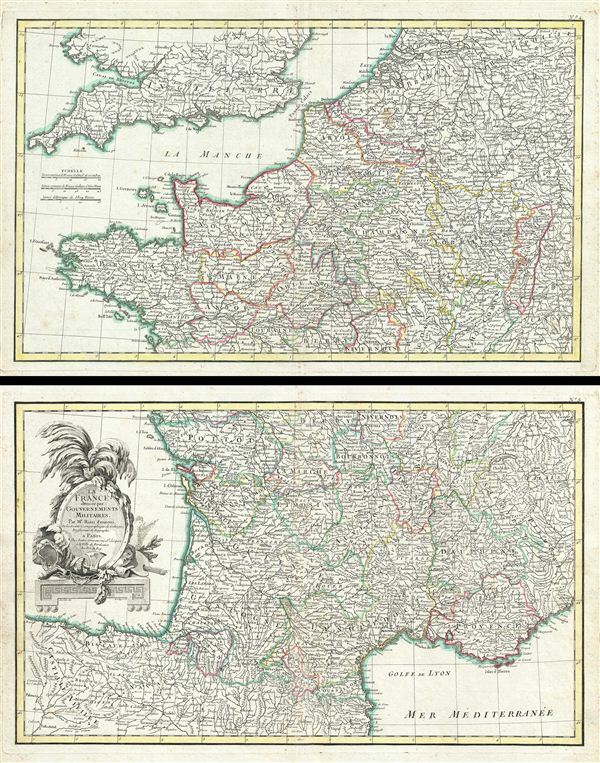 A beautiful example of Zannoni's 1783 decorative two panel map of France. The lower sheet covers from Valladolid, Spain, eastwards as far as Piedmont and northwards to Navernois. The northern sheet covers from Bretagne eastward as far as Switzerland and northwards to the Hague. This map also includes the Channel Islands and the southern Part of england and Wales. France at this time was under the reign of Louis XVI, the last Ancien Regime French King before the French Revolution. Louis XVI was probably not the worse king France ever had, but he was definitely in the wrong place at the wrong time. In the years just prior to the 1889 French Revolution, France had entered a period of sustained economic decline. French in involvement in the American Revolutionary War and the Seven Years War strained the national treasury and put increased pressure on the peasantry. This was compounded by several years of poor harvest brought on by erratic weather patterns associated with el Nino and the 1783 eruptions the Icelandic Laki and Grimsvotn volcanoes. The Royal court at Versailles, isolated and seemingly indifferent to the hardships of the lower classes, proved an easy target. events came to a head on July 14th, 1789, when angry insurgents stormed the Bastille prison, giving birth to the bloody French Revolution and effectively ending the French monarchy. A decorative title cartouche appears in the lower left quadrant of the lower plate. Drawn by Zannoni c. 1783 for issue as plate nos. 4-5 in Jean Lattre's 1783 issue of the Atlas Moderne. Very good condition. Original centerfold exhibits toning. Blank on verso. Platemark visible. Measurement indicates two panels. Phillips (Atlases) 664. National Maritime Museum, 215.